A business card tossed into a tip jar elevated the student band, Grand Ave, from the streets of the San Luis Obispo’s Farmers’ Market to their first single and EP. 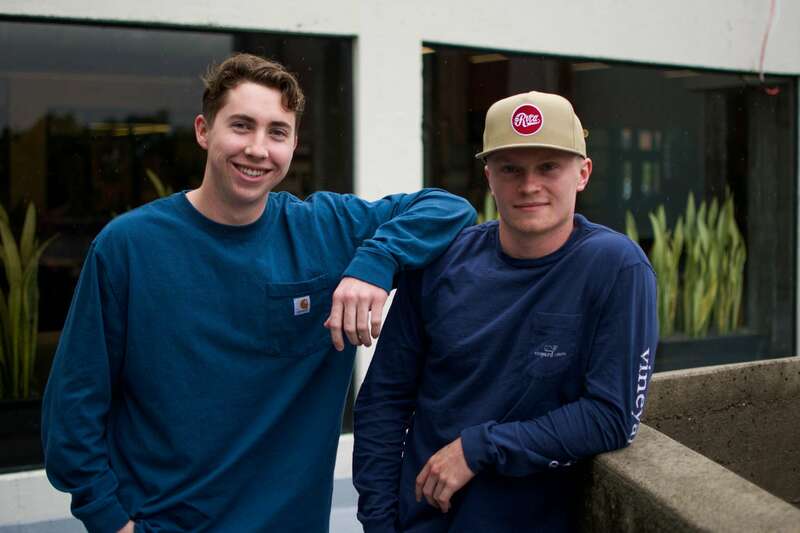 The up-and-coming coastal country duo consists of recreation, parks and tourism administration senior P.J. Repetto and industrial technology and packaging senior Derek Breshears. The two met their freshman year in their Theta Chi fraternity pledge class and bonded over their love for music. However, they didn’t create Grand Ave until their junior year. It was then that they began playing at the Farmers’ Market. “The first time we played Farmers’ [Market] and we got $50 in tips, I was like, ‘Are you kidding me? People paid us to play a song?’ Like, I could [not] believe it. So, the fact that people come back and tip us, it’s insane to me,” Breshears said. One day, Blast 825 owner David Ferdinand gave the duo his business card and a regular gig. Bartender and Sauce Pot studio owner Rick Loughman saw the two performing and invited them to record at his studio. Grand Ave released their first song “805 Summertime” on Spotify and iTunes March 1. They will release another song, “Cut Me Off,” this week and plan on having an EP out, consisting of five songs, by mid-to late-April. Both Breshears and Repetto play guitar, sing and write their own songs. However, the two draw inspiration from different musicians. Breshears looks to modern country artist Thomas Rhett, whereas Repetto connects deeply with John Mayer. “It’s cool because we both have the same taste in music, but I think we specialize in different kinds of music and so, like, I think that’s kind of reflective in our songwriting,” Repetto said. According to Breshears, the duo writes songs about anything and everything, pulling from their own life experiences. Repetto said their songwriting process ranges from writing down lyrics in notebooks to recording parts of melodies on their phones. Either way, the two are very involved in the process, collaborating and bouncing ideas off one another. Grand Ave’s infusion of beach and coastal inspiration with country music has branded them within the San Luis Obispo community. The band frequently plays at Blast 825 and Farmers’ Market. They recently played at Battle of the Bands and Theta Chi’s Sorority’s Best Dance Crew competition and will perform in the Julian A. McPhee University Union April 12. The duo said whenever they perform their original songs, they feel both humbled and overjoyed. “There is a moment when you’re singing a chorus,” Repetto said. “It’s a rush, it’s a thrill,” Breshears interrupted. Although both knew music would be a part of their lives, neither imagined it could be a potential career path. However, with the response they have received, they decided to go to Nashville over spring break to see if they could be propelled further into the country music realm. “If it goes well, I don’t see any reason why we wouldn’t just send it and go to Nashville when we graduate, because, you know, you got one life to live,” Breshears said.